Cauliflower recipes abound these days, and that’s a good thing! The other day I tried a recipe I found in the Wall Street Journal for “Grain-free Cauliflower Couscous.” It tasted delicious, great for carb watchers, and I loved the creativity–high five for WSJ’s Ryan Liebe! But I only used half of the huge head of cauliflower (a specimen of the “cheddar” variety, gorgeous and golden) and there it sat in my refrigerator waiting for me to find a new inspiration. Meanwhile, my attention was diverted to making something yummy to share at a get-together with friends. Edamame sounded like it might have possibilities, so I poked around and found a recipe for roasted edamame . Since I like just about anything roasted, this seemed a sure bet, and I was very pleased with the results as I pulled the steaming, fragrant pan out of the oven. Nutty, warm, slightly crunchy with smooth almost buttery flavor. That’s the good news. The bad news is that an hour later, the little nuggets of glory had lost their edge, just ever so slightly shrinking and drying out. Cauliflower, meet roasted edamame. Yes, it is a match made in heaven, I assure you. A quick sauté of shallots and garlic with finely chopped cauliflower florets made the perfect foil to my leftover roasted edamame: just the right combination of flavors, with the warm nutty veggies lending their moisture to the edamame, which in turn makes this dish substantial enough to stand on its own as a light lunch or dinner. Don’t be surprised if you need to make a double batch next time! Preheat oven to 375 degrees. Toss thawed edamame with 1 tablespoon of the olive oil in a bowl along with salt and pepper to taste. Roast on baking sheet for 30 to 40 minutes, stirring every 10 minutes. Edamame should be slightly browned and puffy. Meanwhile, heat the remaining olive oil in a large skillet and sauté the shallots, garlic, and white pepper over medium heat for 2 minutes. Add the cauliflower and cook uncovered, stirring frequently, for 8 to 10 minutes or until tender-crisp. 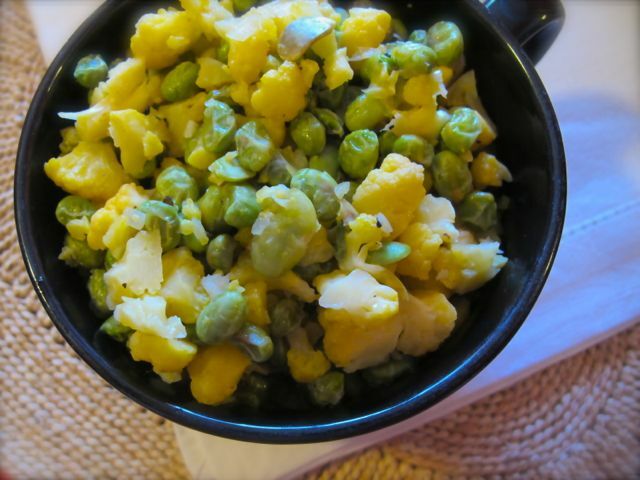 Combine the cauliflower mixture with the edamame, correct seasonings adding salt, pepper, and garlic powder to taste.